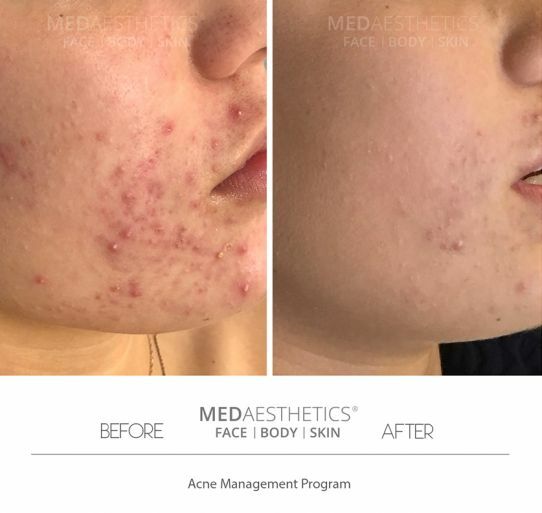 At Medaesthetics™in Perth, we use the Enerpeel™ range of Chemical Peels including TCA peels, Jessner Peel, Salicylic Acid Peel Retinoic Acid Peel to name a few. What are the various types of Chemical Peels? Superficial or light medical peels are the gentlest type of peels available and one of the true “lunchtime” procedures. They gently remove the top, dead layer of the skin, known as the epidermis. They give your skin an instantly brighter look as well as a smoother, more even texture. Light peels are commonly made from Alpha or Beta Hydroxy Acids, known as AHAs and BHAs and include glycolic acid, lactic acid and salicylic acid. Nowadays it is also common to use fruit enzymes and acids from natural sources such as pumpkins, cranberries and pineapples as peeling agents. Medium-depth peels give more dramatic results than superficial peels. Usually derived from TCA (Trichloroacetic Acid), they penetrate deeper into the skin and can be used to treat sun-damage, pigmentation and fine lines. The downside of medium depth peels is that you will have a longer recovery time of about 3-5 days. Deep peels are the strongest type of chemical peel available and can achieve amazing results for sun-damage, scarring and deep lines and wrinkles. They usually use carbolic acid (phenol peels) or high strength TCA to penetrate the deeper layers of the skin. TCA (Tri-chlor Acetic Acid) is one of the most widely used chemical peels in cosmetic dermatology. The concentration of the solution and contact time with the skin determines the depth of penetration of TCA into the skin. TCA targets pigmented cells and stimulates collagen production. An excellent peeling agent for sun-damaged skin exhibiting sun spots, fine lines and wrinkles. Glycolic acid is one of the most common peeling agents in the dermal therapy setting. It comes in different strengths (30% – 90%) and different pH levels (levels of acidity) which will determine how deep it penetrates and how much peeling you get. It can be used to treat fine lines and wrinkles, sun damage, improvement of skin texture, skin brightening. Salicylic acid is unique amongst the hydroxy acids in that it can penetrate deeper into the oil glands causing exfoliation even in the oily areas of the face and scalp, making it ideal for treating acne and oily skin. Lactic acid occurs naturally in human skin and is also found in milk. It is less irritating than other AHAs and has a natural moisturising effect on the skin. It is ideal for skin brightening. It can be used to treat pigmentation, dry or dehydrated skin, sensitive skin and rosacea. Fruit enzymes can also be used as peeling agents. Commonly used fruit enzymes come from fruits such as papaya, pineapple, pumpkin and cranberry. They are antibacterial, promote cell renewal and can digest oil from spots (sebum) and dead skin. They can be used to treat acne, rosacea, dehydrated skin, hyper-reactive and sensitive skin. Tartaric acid comes from grapes and is a less irritating alternative to glycolic acid for a milder exfoliation of the skin. It can also help increase hydration. It can be used to treat acne, photodamage, rosacea, superficial pigmentation and eczema. Malic acid comes from apples and pears and like tartaric acid is a weaker AHA than glycolic acid. It can be used to treat acne, photodamage, rosacea, superficial pigmentation and eczema. Citric acid comes from lemons and oranges and works in the same way as tartaric and malic acids. It can be used to treat acne, photodamage, rosacea, superficial pigmentation and eczema. Am I a candidate for medical skin peels? Peels can improve the appearance of your skin making it look healthy, vibrant and fresh. If you have a history of poor skin healing and keloid scarring you may not be suitable for a peel, especially a stronger, deeper peel. If you have any infection on your face, you may be best advised to wait until it clears up before having a peel. People with acne who have been using isotretinoin (Roaccutane) within the last 6 months are not suitable. The best way to discover if a peel is right for you is to have a consultation with one of our aesthetic practitioners who can assess your skin and talk to you about your concerns before advising what type of peel may best suit your needs. What do I have to do before a chemical peel? Before you have a chemical peel you will need to have a consultation with one of our clinicians. This will be your opportunity to discuss your skin concerns so we can decide what type and depth of peel will be best suited to you. A medical history will usually be taken to make sure there are no reasons you should not be having the treatment. We recommend that you should avoid exfoliating your face, sunbathing or using tanning beds and changing your normal skincare regime unless instructed to do so by us. It is important to remember that with certain types of peel you will have to prepare your skin beforehand. This will involve using homecare products for about two weeks before treatment and avoiding sun exposure. Please make sure you stick to the routine given to you by our practitioners as this will enhance your results and significantly reduce downtime. This depends upon the type and strength of peel you are having. Typically with a superficial peel your skin will be cleansed and the peeling solution will be applied. In some cases this is removed after a few minutes and in others you may leave the clinic with it on and remove it at home later. During the peel you should feel nothing more than a slight tingling or stinging sensation. With many superficial peels you won’t feel anything. The treatment is really quick and easy and can take as little as 10 minutes. With medium-depth peels the skin is also thoroughly cleansed before the peeling solution is applied. We apply numbing cream beforehand and a fan is used to cool the face during the procedure. The peel will then be neutralised and removed. As this is a medium-depth peel expect the treatment to be more uncomfortable than a light peel. You may feel some temporary stinging, burning and irritation during the procedure. What should I expect after a medical peel? With superficial peels, you may get a little bit of pinkness and some mild skin peeling for a couple of days, but in most cases, you will be able to resume normal activities straight away. With medium-depth peels, there is a more extended recovery period, usually 3–8 days, (although, very rarely, your skin can stay pink for a few months). You will also get more peeling with a medium-depth peel. Your face might be sore and swollen and feel tight after treatment. You can take painkillers to control this and use an antibiotic ointment to reduce the risk of infection. You must avoid scratching or picking off any peeling skin as you may cause your skin to bleed and be left with scars. With all chemical peels, you should avoid sunbathing afterwards and make sure you wear a sunscreen when you go out, even if it is not sunny, as you may develop brown marks on your skin known as hyperpigmentation. We also recommend medical makeup to all our clients to cover the redness and facilitate healing. What do I need to do after treatment with medical peels? As is the case with all skin resurfacing procedures, it is critical to stay out of direct sunlight and keep the treated area well moisturised. No exfoliation or skin products with active ingredients such as vitamin A (retinol) should be used until the skin is fully healed. For most superficial and medium-depth peels, the treated area will appear slightly red and have a slight sunburn sensation, possibly accompanied by some swelling. This usually lasts 2–24 hours and can be soothed with cold gels, ice packs and special post peel soothing creams recommended to you by our staff. Keep skin clean and use sunblock with a minimum of SPF 30+ and mineral makeup. You may notice peeling a few days after your peel. There are virtually very few risks associated with light or superficial peels. Occasionally, some people may experience a mild allergic reaction or hypersensitivity to the peeling agent. This is usually self-limiting. On rare occasions, some people develop hyperpigmentation (brown marks on the skin) but this can be avoided by ensuring you wear sun protection, even when it is not sunny outside. There are some risks associated with medium-depth peels. These are usually associated with the healing process after the peel. This may include prolonged redness, hyperpigmentation and skin sensitivity. There are a number of risks associated with deep peels, the most common of which is hypopigmentation (loss of pigment in the skin). This can be permanent and is particularly bad if you have a darker skin type, as it will be very noticeable. As with all peels you are also at risk of hyperpigmentation so make sure you religiously apply sunscreen with a high SPF. Scarring is another risk. Deep peels can be very traumatic to the skin so it is vital you go to a highly experienced doctor to have your treatment. Each patient is an individual and requires an individual combination of chemical peels. This is assessed during your consultation with the treating doctor. A treatment plan is mapped out for each patient and the cost can be assessed at this time.